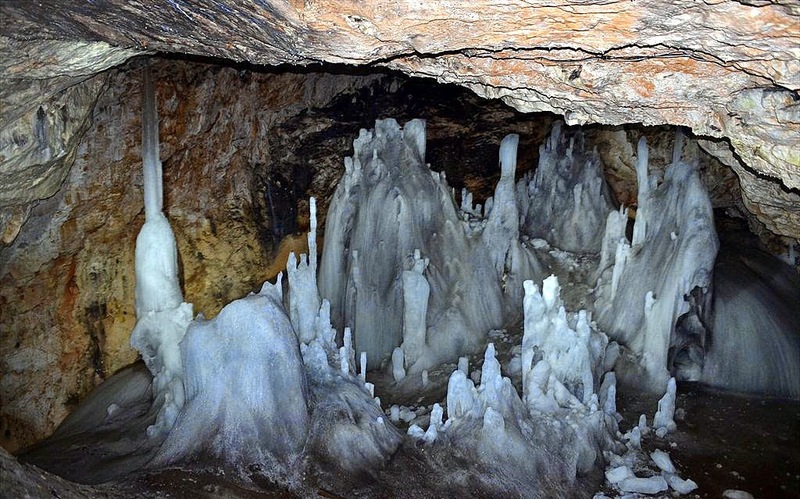 Scărișoara Cave is one of the biggest ice caves in the Apuseni Mountains of Romania, in a part of Carpathian chain. It is considered one of the natural wonders of Romania. 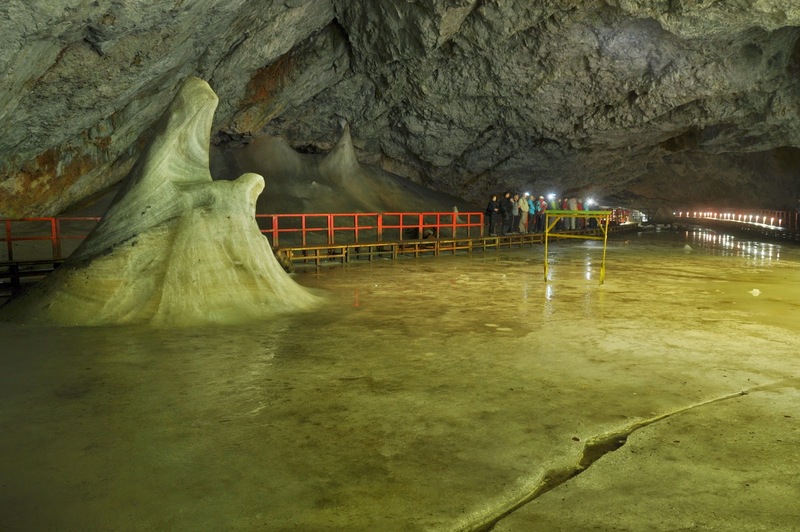 First mentioned in 1863 by the Austrian geographer Arnold Schmidl, who made some observations and the first map of the cave, it was later explored by the Romanian scientist and speleologist Emil Racoviță between 1921 and 1923, who mentioned it and its origin in his 1927 work Speleology. 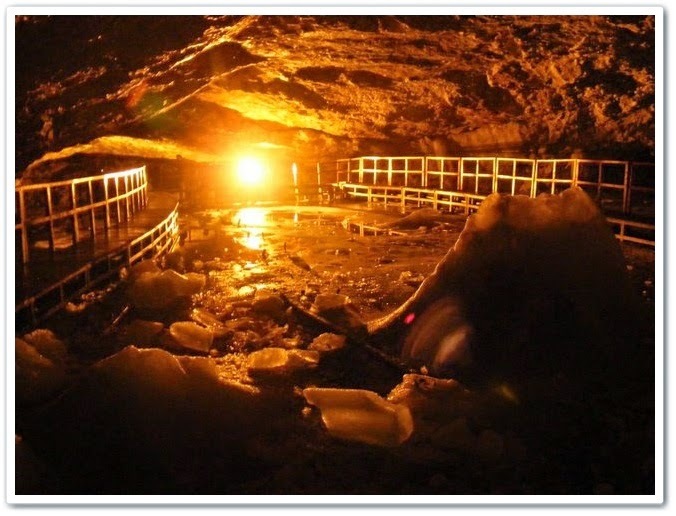 According to the scientist Emil Pop, the ice cave was formed 3500 years ago, during the glaciations, when these mountains were covered by snow and ice, although the exact date when the cave was discovered is still unknown. 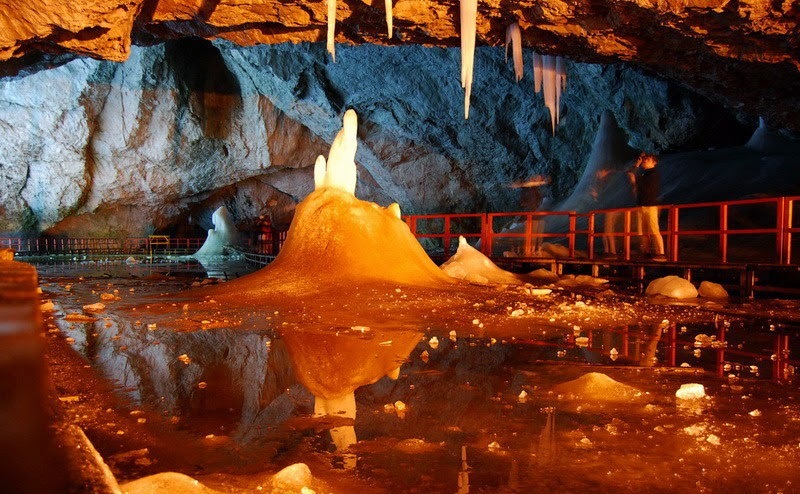 The cave is located at an altitude of 1165 metres above sea level. It is 105 m deep and 720 m long, and the entrance shaft (60 m in diameter and 48 m in depth) gives access through metal stairs to a large chamber, (108 m long, 78 m wide) - The Big Hall.
. From this point three openings lead to The Church (in front, with over 100 stalagmites), Great Reservation, Coman Gallery (left) and Little Reservation (right). The part that tourists can visit includes the entrance shaft, The Big Hall and The Church, the other chambers,which can be visited only with the agreement of the Speological Institute of Cluj-Napoca, being reserved for scientists. The glacier has a volume of 75000 cubic metres and has average thickness of 16m.. The temperature is up to +1°C in the summer and down to -7°C in the winter. In the part for tourists the average temperature is around 0°C. Bats live in the ice cave, as do small bugs (2–3 mm long) called Pholeuon prozerpinae glaciale. In the Big Reservation a Rupicapra skeleton was discovered.